Viva la Vida, so the Coldplay title goes. It’s a sentiment seldom expressed by artists of a certain brand—the kind who prefers to brood over loss, transience, and death. In a way it’s easier: sorrow and poignancy often go together in serious art, whereas happiness is considered trite, banal; there are many more types of sadness than joy. And with a subject like death—how not to be fatalistic? How to find happiness? “Bring tissues,” a friend warned me before I saw Amour. Michael Haneke’s film, starring Jean-Louis Trintignant and Emmanuelle Riva, follows an elderly couple’s struggle against the final betrayal of the body. In it human expiry is a horrible spectacle, involving stages of decay and deterioration, disgraceful in the utmost. Amour confirms everything we know to be true about death, and amplifies it to an almost intolerable note. This impression is made all the more strongly by the film’s first scene, which shows a close-up of rows of theatergoers—a mirroring effect intended to tell us, This film is about you. The point comes across immediately—amusing at first, a fine trick—but the scene lingers on and on until it is no longer just uncomfortable, but something worse. Five minutes into the film, and already we’re faced with the certainty of our own demise. It’s an understated memento mori, full of artifice but at the same time utterly without; it is a relief to be able to look away. Yojiro Takita’s 2008 film Departures takes a different approach. Masahiro Motoki plays the lead role of Daigo, a cellist-turned-encoffiner who has to cope with the social stigma around his new profession. Initially skeptical, he slowly comes to appreciate the role’s importance through his boss Sasaki (Tsutomo Yamazaki), but finds it difficult to communicate this newfound profundity to his wife Mika (Ryoko Hirosue), who harbors the conventional biases of many Japanese. At the same time Daigo has to confront his own feelings about his father, whose early abandonment threads through his entire adult life. Departures handles its subject the way its protagonists treat the dead: gently, carefully, with the utmost respect and sensitivity. Without being false, it lends dignity to the awful truth of our existence by couching it in love and tradition. There is love in Amour, of course, and Georges’ final act reflects the extent of his devotion toward Anne, but ultimately it is about resistance—human temerity in the face of death, where consolation comes only in the tiniest increments. Departures, conversely, tends toward acceptance. Spliced among numerous scenes of death are those of consumption, eating as evidence of life. As they share a meal of puffer roe, Sasaki tells Daigo, “The living eat the dead to survive.” Here death is not the enemy; it is the way of the world. We grieve and we move on. In the end it turns out I didn’t need tissues for Amour. It’s a heavy film, extremely sad, and my eyes turned watery at one point, but I never did actually cry. Strangely, it is in the more uplifting Departures where I found myself unable to hold back the tears. The film offers so many trite moments (like cello-playing in the fields), but somehow it still works, cradled in an overall atmosphere of tenderness. Joe Hisaishi’s marvelous score abets this sincerity, as well as the seamless cinematography. The recurring shots of swans particularly resonated with me, as it echoes W.B. Yeats’ poem about nature, existence, and the passing of time. Far from being a lament, most viewers’ tearful response to Departures is an acknowledgment that we see here is very human, an attempt to make death bearable through ritual, an attempt to give meaning to the incomprehensible. While watching it I let go of my critical self and saw it simply as a human being—frail, temporal, hopeful as we all are. This is, I suppose, the highest praise you can give any work of art. 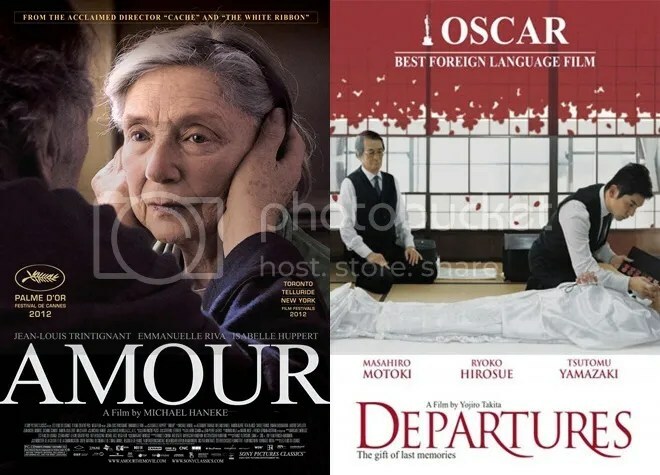 This entry was posted in Drama, Film and tagged Amour, Departures, Emmanuelle Riva, Jean-Louis Trintignant, Masahiro Motoki, Michael Haneke, Okuribito, Ryoko Hirosue, Tsutomu Yamazaki, Yojiro Takita on March 3, 2013 by Michelle.